PUEBLO – Chianna Schoenthaler, Strasburg, Colo., and Michele Bedard, Paris, Texas, both senior mass communications majors at Colorado State University-Pueblo, have been selected to present their original research on fake news at two conferences in April -- The Web Conference 2018 in Lyon, France, and at the DePauw University Honors Research Conference in Indiana. 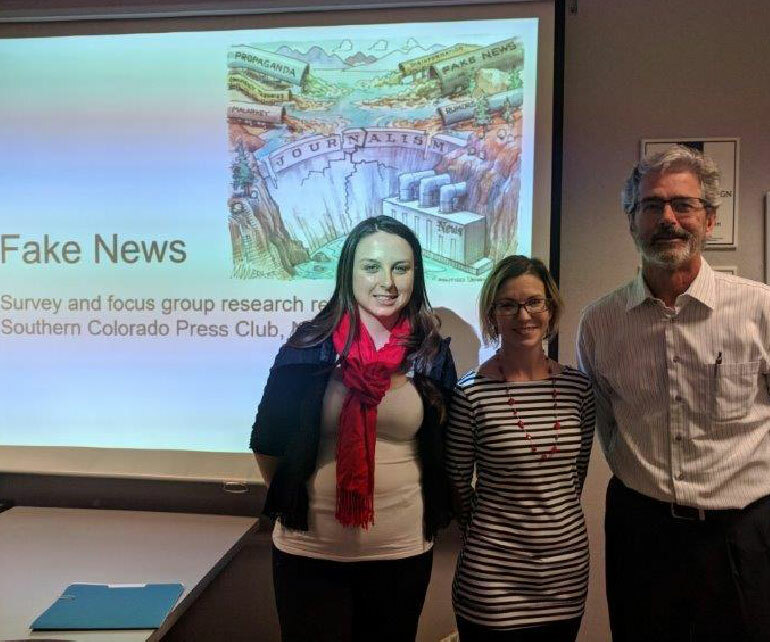 Schoenthaler and Bedard were members of Dr. Samuel Ebersole’s Spring 2017 Audience Research and Methodologies course, which focused on fake news as a central topic for multiple research projects. Six teams of students conducted primary research (surveys, focus groups, experiments) with participants that ranged from students at CSU-Pueblo to social media contacts and members of professional communications organizations. Their research proposal was one of 12 (out of 43) selected for oral presentation by the Misinformation Track Chairs committee for the Web Conference. Their submission also will be published in the companion volume of the Web Conference 2018. The convention is organized by the International World Wide Web Conferences Steering Committee (IW3C2). The conference provides a forum for discussion and debate about the evolution of the Web, the standardization of its associated technologies, and the impact of those technologies on society and culture. Ebersole said Schoenthaler and Bedard expanded their research over the summer with four additional groups of college students, University staff members, and local media professionals. This brought their total responses to 38 focus group participants and more than 400 surveys. After analyzing the survey and focus group data, Ebersole said the project team realized it had interesting findings and began looking for opportunities to share the results. They began with a presentation to the Southern Colorado Press Club in November and then submitted to the two conferences: The DePauw University Honors Research Conference in Indiana as well as the Web Conference. Schoenthaler is a member of the President’s Leadership Program, the assistant editor-in-chief and social media content manager for the CSU-Pueblo Today, a member of the National Society of Leadership and Success, and a member of the Alpha Lambda Delta-National Honors Society. She will graduate in May 2018. Bedard is owner and executive pastry chef at Twenty-One Steak. She will graduate in August 2018.